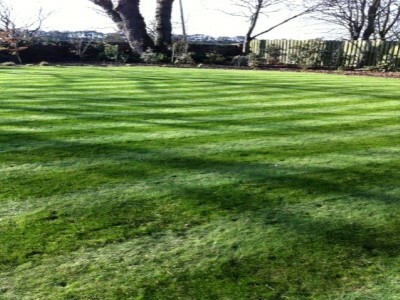 Why not let us do the hard work for you and ask for a free quote to lay your new lawn. 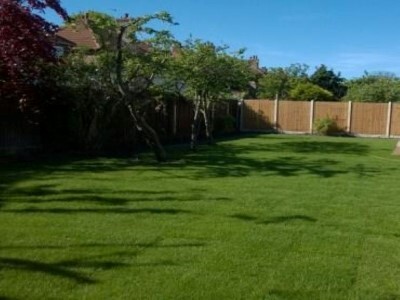 Whether it’s removing old lawns and preparing the ground, laying new turf or laying turf on an already prepared site we are happy to offer a free quote for any site..
We use our beautiful seed grown lawn turf, grown on some of the finest topsoil in South West Lancashire, and as part of an environmentally friendly rotation policy, which results in a fully mature root system and finest quality turf at the best price. Together with top quality topsoils we offer an efficient and high standard turf laying service. Please feel free to give us a call with your address and approximate measurements of the site and we will be happy to call round to give you a no obligation quote. We can remove your old turf, clear your garden and major preparation, or just simply lay your new turf on a ready prepared base, we are happy to quote. 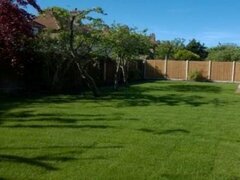 Here are just a few photographs of lawns we have laid. Job done, another beautiful lawn…. just a little TLC from you keeping it watered and your new lawn will flourish. Obviously natural rainfall is by far the best form of watering, but a soaking with a hose pipe will be fine too. For the first 7-10 days and in drier weather, turf should be watered daily, but avoid full sun as this will scorch the lawn. NB Overwatering can be as damaging as under watering as this causes water-logging and soil shrinkage. Simplicity is key... grass needs nitrogen rich fertilizer during spring and summer months and in late autumn it needs phosphorous to encourage root growth. Now stand back and admire your new lawn .... beautiful!